It looks like I’ve done a good job of letting ages pass between posts lately. That’s the way it is these days. Life is happening so dang fast, and the few quiet moments I have, I generally spend sleeping or binge watching Roswell or some other long-gone show that is free on Amazon Prime. 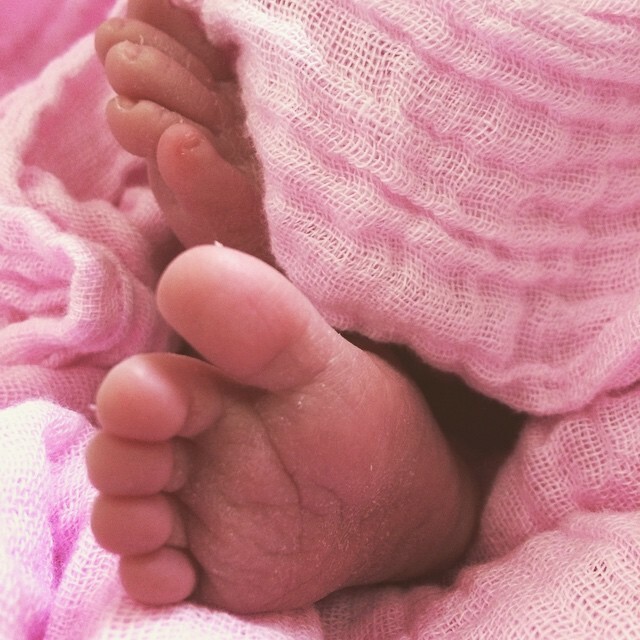 But, for a quick update on our little girl: there’s still no real update. Not really anyway. The last court hearing was about six weeks ago but the decision was delayed because a family member had come forward and more time was needed to evaluate this person. In the last six weeks, we have been given the impression by our county social worker that the family member will probably not end up with Our Sweet Girl, and that the recommendation is to “fast-track” her case for permanency with us. Nothing is final though. And I know of other families who have been told the same thing and still had to say goodbye to their babies. We’re trying to stay positive and hopeful nonetheless. The next court date is in about three weeks. So please be praying with us that a decision can be made. Of course, we want the decision to be in our favor and we pray for that. But ultimately, we want her case to move forward. The other big detail in our life that I haven’t mentioned here in this blog is that I’m pregnant. Whoop! Yay! We found out about a month or so before we finished our fost/adopt certification and at that point felt totally committed to the process so we went for it. In fact, the timing of this pregnancy actually felt like confirmation that we were on the right path. The thing is, we’d been trying to have another baby since I got the all clear after Harry was born. At that point, it had been about two years. And if it had worked any sooner, we probably wouldn’t have gone through with the fost/adopt plan. So when we found out our wonderful news so late in the game, it was like God was reaffirming our resolve. Like he was saying, “Yes, I was waiting for you to go down that path, and because you’re opening your hearts in that direction, I’m going to overflow it with all the things you knew you wanted plus all the things you didn’t even know I had for you.” So here we are, less than two months away from having another baby! There you go. A very brief update. I have a few topics in mind that I keep tossing around. Things I’d like to share here. But I’m not ready to dig into them yet, so I’ll let them stew a little longer. But I didn’t want to let too much time pass… Or maybe I should say, too much MORE time. Ha! Because it’s already been too long. I last posted on April 12 about waiting. We’d finished the certification and we were in the waiting phase. But it didn’t last long. Only a few days later we got a call that changed everything! It’s been a month! It’s flown by so incredibly fast. We’ve had quite a few loooong days in there, but overall, I can’t believe it was one month ago already that we brought home our sweet little girl. She’s doing great. She was only ten days old and five tiny pounds when we got her. But she’s plumping up beautifully and I am so over the moon in love with her. She’s growing and developing so much already that even in this short month, I feel like she’s not the same baby. It’s still too early in her case to know for sure what direction things will go. We don’t know if we’ll get to keep her forever. And while there is a big part of my heart that hopes we will, I still long for the healing in her parent’s lives to take place so that they can be reunited. I have said before how deeply I desire to see families healed. I don’t like learning details about the family because it’s so hard not to judge them and convince myself what the outcome should be. And it’s really really easy to only see the bad parts when in reality there is plenty of good, too. But it’s not my place to judge them or decide where this sweet girl should end up. And I want so badly to trust the court’s decisions as they come. So, while we wait for the next court date in June where we will get a better idea of what the future holds (although we’re still a long ways from a final decision), we are just continuing to pray that all the important information comes to light, that the social workers, lawyers, judges, assessors and everyone else involved have clarity and wisdom, that her parents take the steps they need to take and make choices that put this sweet girl before themselves and finally we pray that our own hearts will be protected in this process. Now we wait. I say that is if the waiting has just started, but in reality it has been going on since we made the decision last fall to move forward with foster care and adoption. But now, we’ve done everything that we can do. And we are in the final season of waiting before we get our first placement. There will be a whole new season of waiting once our first placement comes, but right now, its like the calm before the storm. It’s like being due, but not really having an induction date. When you’re waiting to give birth, you know there’s a date by which you will have the baby, the doctor won’t let you go beyond that date. But in this case, we don’t have a “definitely by this date” date. We thought we had finished the homestudy before the end of March. And we thought that the certification would come through on or close to April 1. This means we thought we could get a baby as early as April 1! But when April 1 rolled around and I didn’t hear anything, I called the agency to check the status of our clearance and our caseworker let us know she had some more questions for us. She came out to the house and spent a couple more hours with us, And then the next day, she called us to let us know she was ready. That she had everything she needed to complete our report. But, the main person in the office who submits the final step for certification was on vacation untill the following Monday. They told us we’d hear the next week between Monday and Wednesday. Well, Monday rolled around and we didn’t hear anything, but I figured if she’d been out for at least a week, she probably had a pretty big stack of work on her desk to go through and I wasn’t sure where we were in that stack. But I didn’t hear anything by Wednesday either and I was trying to decide when I should call. I know they need families, so I don’t think they were putting us off, but I was also anxious to get an update. I was planning to call around lunchtime on Friday, but late Friday morning I got an email. The email said we had done nearly everything, but they needed one more form! The form happened to be somewhat of a hassle, but I was able to get it done and send it back. By Friday afternoon we got a congratulatory email confirming that our certification process was complete. We are officially licensed to be Foster parents and to adopt! So now we wait. And while we do, let me give you an update on a decision made regarding this process. When we started this journey, we really started it with the mission to complete our family. We wanted to have another baby and we were anxious to do that on our time line. But as we moved forward through the training process, and simply through prayer about this decision, the Lord has really changed our hearts to focus not so much on completing our family, but on helping other families. So often, you hear about situations on the news or through social media where you find yourself saying, “I wish there was something I could do to help!” Well, this is something we can do to help. We can care for babies who need a home. And there are an awful lot of babies who need a home temporarily. There are a lot of families who need time to heal and recover. And we are so excited to take the next step in this journey. I have shared before my heart towards the mothers. How much I ache for a woman who doesn’t get to be the one to hold her baby in the night and comfort her crying. I ache for the baby who doesn’t get to be held by her own mother. She has to finds comfort in somebody else’s arms. I desperately want for babies and mothers to be together. But I know that’s not always possible. So while we wait to become foster parents, we pray fervently for the mothers and babies. For the entire family. We pray for healing and redemption. We pray for God’s hand to work in their lives to soften their hearts to turn them towards Him, for them to be touched by His great love. We pray that we will be humbled as we love another family’s baby and that our hearts will remain compassionate towards the parents who don’t get to be the parents. We definitely do still plan and deeply desire to adopt through foster care in the long run. But for now, we are only going to be taking temporary placements and we look forward to seeing reunification between babies and their very own families. With that, we ask you to join us in praying for the impact this will have on our family. We know it is not an easy journey. We know that we are in line to get onto a really exciting roller coaster. That the emotional ups and downs will be challenging to say the least. But we also know that it will be worth it. So we ask the Lord to give us strength to get through the long nights and more love than we believe our hearts can hold, and comfort when the time comes to say goodbye, and peace while we wait between deadlines and decisions that are made by other people. And most of all help our faith to grow and our trust in God to be enough. Disclaimer: I started drafting this post back in January. I didn’t post it then because I needed to collect some pictures of the various projects. I’ve been kind of busy with all other life stuff and forgot about this post. But better late than never, I suppose! Enjoy. 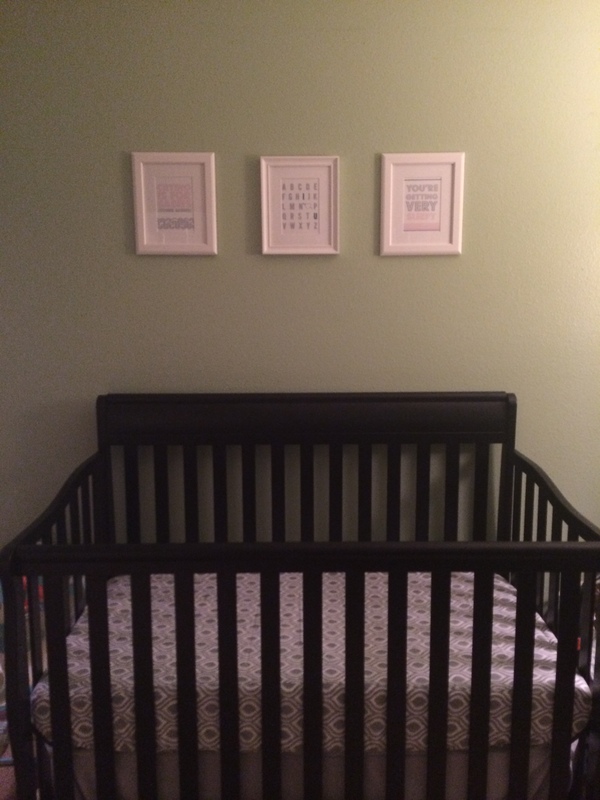 So, it turns out the nesting instinct is just as strong when you’re adopting as it is when you’re actually pregnant. And, you’re not too pregnant to actually do all of the stuff that looms over you, so that’s a plus. Paul has been on break for the last two weeks and we have had the most productive two weeks we’ve had in a long, long time. Two weeks ago doesn’t even feel like two weeks, that’s how much has happened! The first big project that we completed is the office/guest room smoosh. I wanted to clear out the guest room to convert it into a nursery, but to do that, we had to make space in the office. So we had to completely reorganize the office, get rid of one of the desks, and make room for the bed. 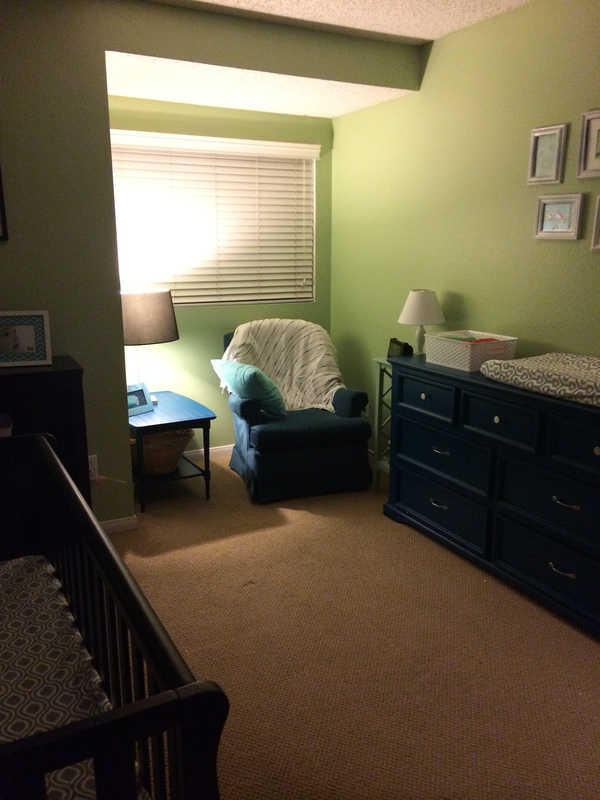 In the process, we also baby proofed the office, covering all the outlets, organizing cords and making sure it meets all of the home study standards. I still have a pair of scissors on the desk, lol, but I’ll be sure to put them in a locked cabinet before the home study. I will also mention that when I redid the office a few years ago, I did not create enough storage space. This turned out to be very problematic because as time passed, the office turned into a dumping ground for random stuff. All that had to be dealt with before we could bring down the guest bed. One element of this project that I am particularly proud of is the new wall shelves. There was an old cheap, falling apart bookshelf in the garage that wasn’t storing anything too important. So, we moved things around and dismantled it. We salvaged the shelves and Paul put some brackets on the wall above the desk. And Boom! We had more storage space for the office supplies that need to be readily accessible! Once we got the office ready, we brought down the bed and it turned out it was too tight of a fit to leave the corner bookshelf where I had wanted it. So, we got creative and tipped it on it’s side. Paul built some stools for the other side of the bed and now there is a lot of storage space under the bed. I’m also calling it a loft bed, now, because it’s just too high tobe a normal bed. Haha! The next project we completed during this Christmas break is refinishing an old dresser I had bought from a local buy/sell group. I sanded it down, and painted it a dark peacock blue green color and swapped out the ugly old handles for brushed nickel looking ones. 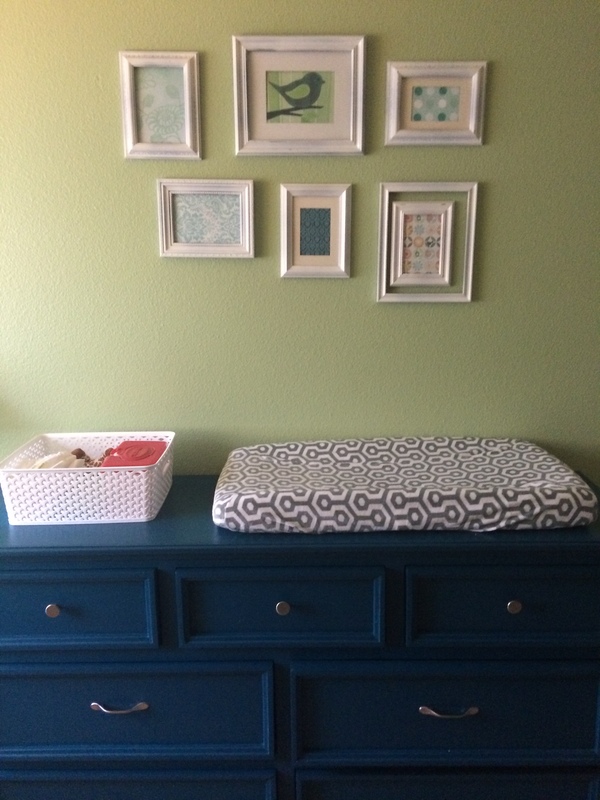 I also decided to paint an old end table we’d had tucked into a closet to match the dresser. Paul was a little concerned about the color I picked, but once it was on the dresser, he loved it as much as I did from the beginning. 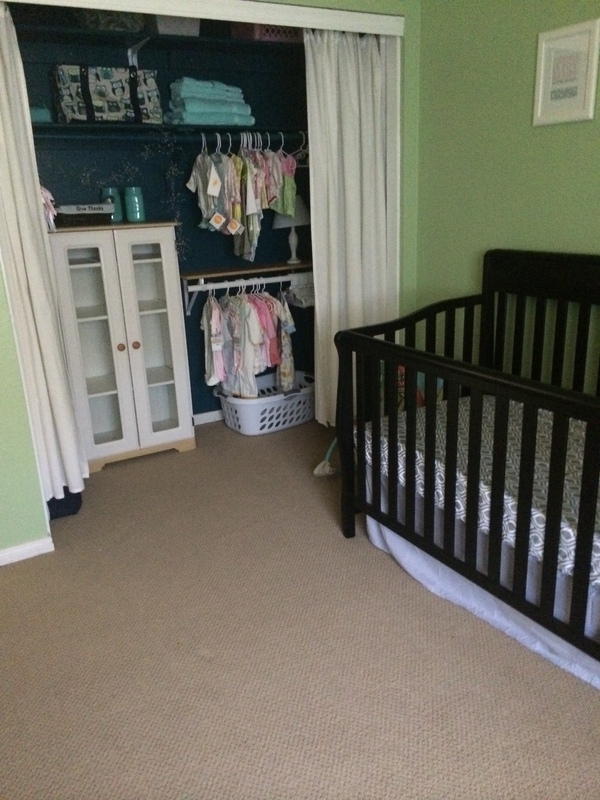 Another project we worked on was getting the previously called guest room to qualify as a nursery. So what does that mean??? It means a crib! Yay! My parents gave us the crib for Christmas, so Paul got it set up. I also created some prints (inspired by Pinterest, of course), framed them and hung them on the walls. I would still like to do a little more decorating, but I think that will come with time. The next project we worked on was building gates for the top and bottom of our stairs. This is one of the requirements for the adoption process, so it was a high priority. I had been thinking about a gate for the top of the stairs since we had Harry, but he’s never really been allowed to roam free upstairs. And now, he knows how to do stairs by himself so I thought we sidestepped that phase. But since we needed to get it done, I revisited the ideas I’d had floating around from way back. 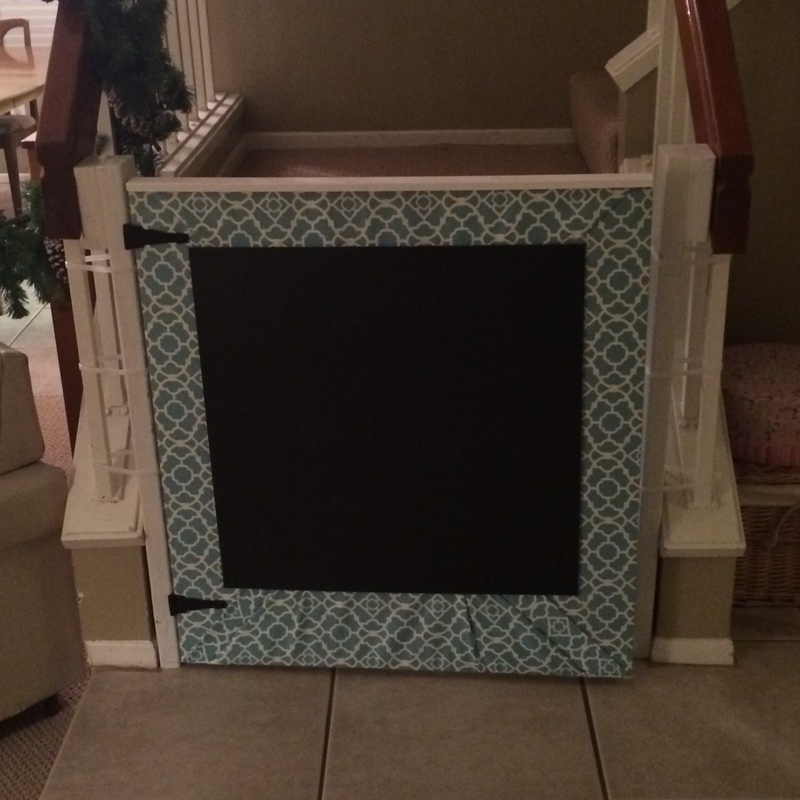 I am not crazy about the pre-fabbed baby gates. They tend to be cumbersome and expensive and not to mention major eye-soars. Pinterest to the rescue yet again! I’d seen a number of homemade, farm-door style gates and we decided to use that as inspiration. Eventually, we used plywood covered in fabric and chalkboard with some pretty and chunky hardware. I am very happy with the outcome! And it’s a good thing I like it since we have two! 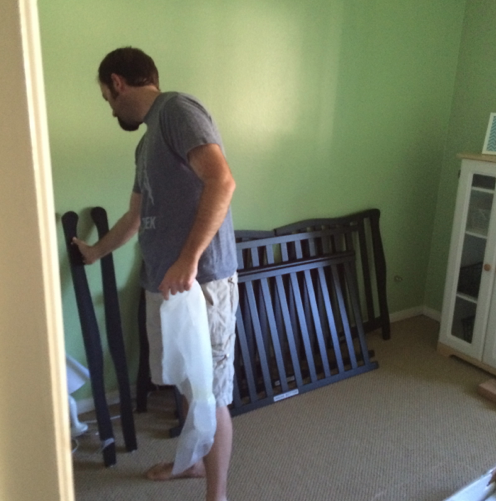 Once the gates were completed, I moved on to the closet for the nursery. A few years ago, I painted it green to match the green in the room. That actually made a huge difference in making it so much more attractive. There are no doors, so we’d hung a curtain up instead. The problem was that there was only one shelf and one rod across the length of the closet. It was a very inefficient use of space! 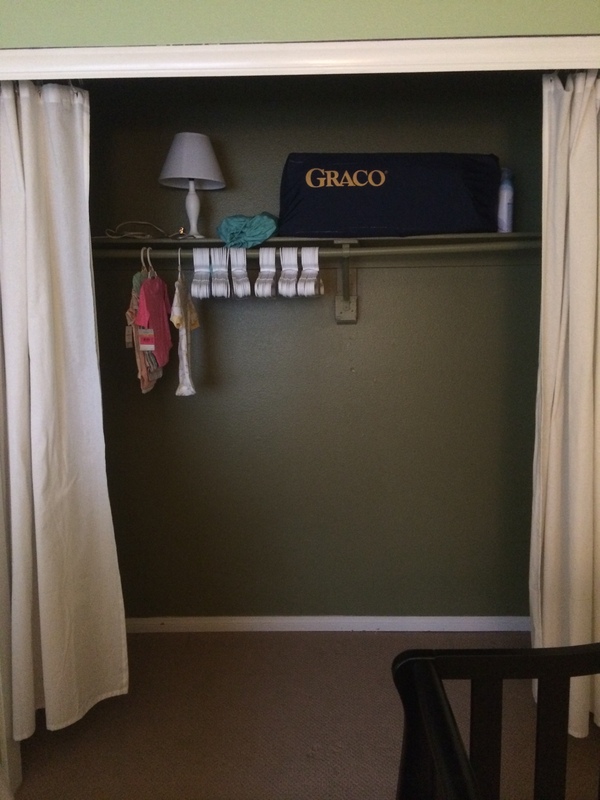 I went back and forth in my mind about how much time and effort I wanted to invest in the closet. I also didn’t want to spend a fortune on it. So I scoured Pinterest yet again and took a field trip out to The Container Store in Pasadena with a couple friends to get ideas. Eventually, I decided to add a column of shelves on one side and another rod with a shelf above it that only reaches half way across the closet. I also wanted another high shelf that stretched the length of the closet. 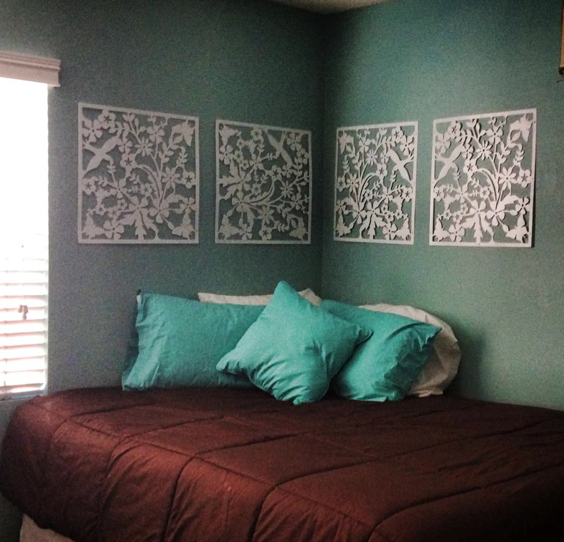 But of course, I couldn’t do any of this until is was painted pretty to match the room! 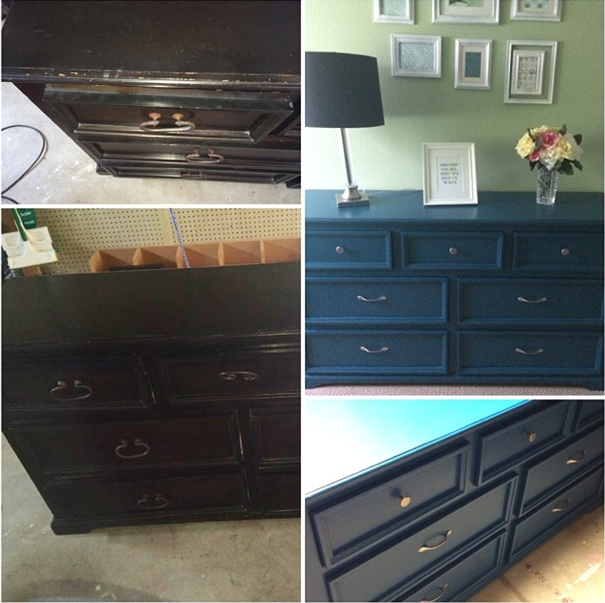 I used the same paint I had used on the dresser and end table. 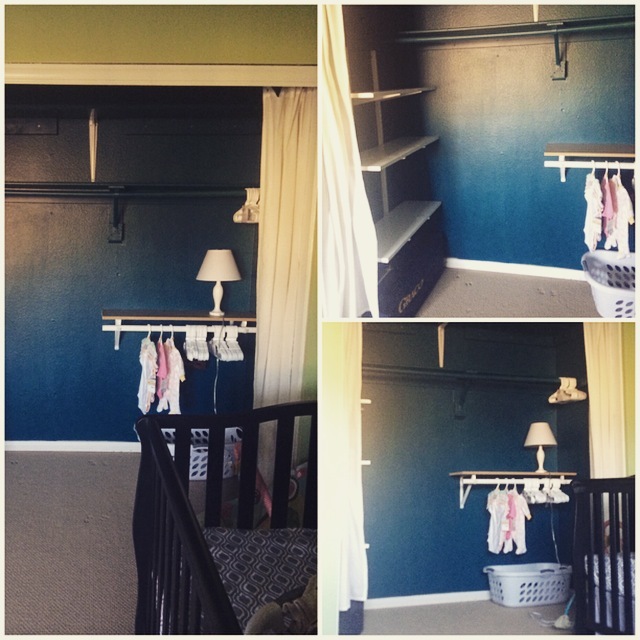 By using left over wood from other projects, our total cost for this closet makeover was only about $75, which makes us both happy! 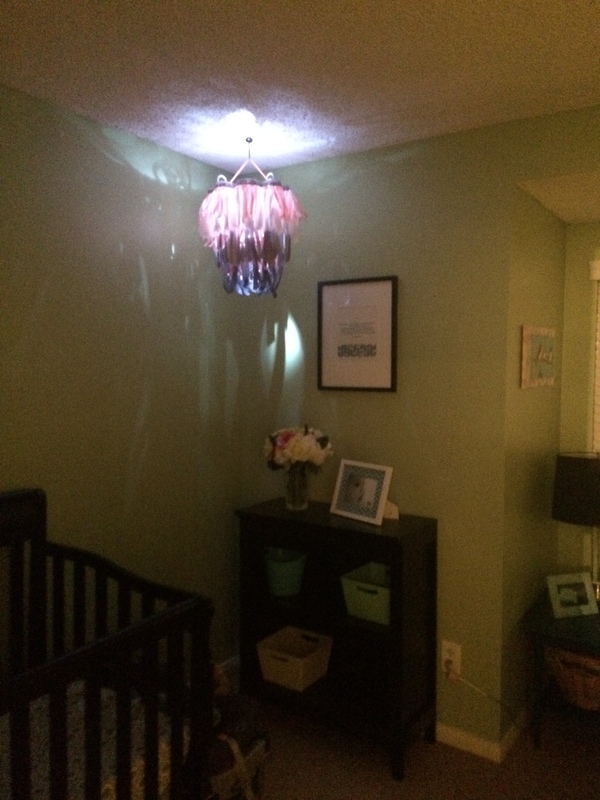 With a few final touches to the nursery, like a ribbon chandelier I made from a wire cupcake tower and some more art on the walls, I feel like the nursery is officially ready. I know that once we actually start using it, it will start to fill up and looked lived in. I can’t wait to get to that point. I shared recently that we will probably bring home a baby by early spring. But, I want to share that having the baby in our care does not necessarily mean that baby will be ours forever. We are going the foster to adopt route. This means the little ones we take in will most likely be in a situation where there is potential for reunification with their first family, their biological family. While I know it will be very difficult for us to care for a baby and then give him or her back, there is a part of me that still hopes for that. Not because I will want to hand the little one over, but because I want for mothers and babies to be together. Because I believe that healing and reunification is better than staying broken. And because I’m not there yet and I haven’t experienced the deep feelings of wanting what’s best for a baby and wanting for the best to be me even though it might not be. You see, it is easy to see a woman who has lost custody of her baby and say, “oh yeah, she’s so messed up.” It’s easy to see her brokenness from the outside and judge her and think I’m better than her. And to think that I would never be as bad as her. It’s easy to feel smug and self-righteous when I hear the numerous situations that lead to a woman having her baby taken away. And it’s easy to feel like a hero because we are rescuing a baby in need. But the truth is I’m broken, too, even if it’s not as visible from the outside. My body is broken and that’s keeping me from having another baby. And my heart is broken because of the longing. And my faith is broken because I don’t understand why God will put a baby in the womb of a woman who can’t or won’t care for it while I ache for another baby and yet my womb remains empty. I hate that it hurts so much. I hate that my faith wavers because of this hurt. And I am ashamed that this journey has left me angry and cold and that it taints my view of the world around me. I am heart broken that infertility has burdened us for two thirds of our marriage and that I don’t seem to be the same person I was when I said “I do” because of it. My brokenness may not be as visible to the world around me, but it weighs me down in ways I never expected. Yes, I am so so very broken, too. And God sees my brokenness as clearly as he sees the brokenness of the other mother. And as Paul and I are getting ready to welcome home a new baby, the Lord is revealing my brokenness to me. And He is showing me how much I have in common with the other mother. And He is gently reminding me just how much He loves us both. When I think about the woman who will give birth to the next baby that I call my own, I am growing to love her and ache for her. I want her brokenness healed just as much as I want my own brokenness healed. I want to be a part of that healing. I want to be used by God to bless her and care for her. And I know that may entail caring for her baby as if it were my own simply to give him or her back after a time of healing has passed. I don’t WANT to bring home a baby that I don’t get to keep. But I do want healing and reunification to take place between the mothers and children who are broken. And I am willing to help even though it may hurt. And I know that God will use my willingness to help her in my own healing process. So what now? What does the timeline look like? Ever since we shared the news that we are planning to adopt, there have been a few questions that keep coming up. The first one that everyone seems to be asking is “when?” I think by that question, they’re really asking when we will bring home a baby. And the answer to that question is… soon. It could be as early as late February or it could and will probably be more like April. Either way, that feels really soon to me. We had our initial screening meeting with the agency in early November and were given our application packet at that time. The packet includes a lot of homework. A LOT! And there’s no official due date for it, but we obviously can’t move forward without it. Our classes will start in late January and are pretty well compacted into about three very intense weeks. Once we complete the classes and turn in our completed packet, we can move into the home study process. This process can be quick, or it can take a while. If there are issues that need to be addressed with our home, it will push back the completion of the home study. If there are a lot of families ahead of us in line, then that will push back our home study. Or, if there are any pieces of paperwork missing at all, then it will… you guessed it… push back the home study. There are a lot of factors outside of our control. And there will most likely be quite a bit of rushing to get to the next step, then waiting for it to be completed. Of course we don’t want the process to take any longer than it needs to. And we don’t want to cause any delays by not completing something ahead of time that we could have gotten done. So right now, we are focusing on completing our application and getting our home up to “home study” standards. Our goal is to hand in our completed packet by the end of our classes so that it can go straight into the hands of the case worker who will do the home study. Our self-imposed due date is the end of January. Assuming all goes well and smooth, the home study will be started and completed in February. But we want to mentally and emotionally prepare ourselves for the likelihood of some delays. When everything is done, we will sit by the phone and wait for a call. There are some situations where families get a call the same day or week. Or, some families have to wait a while. We don’t know. But we know we want to do everything we can to get ready so that when the call comes, we are able to say yes. And then we will have a baby. Yay! Disclaimer before you proceed: I know that this blog has traditionally been pretty much focused on crafts and cakes and whatnot. And that means it’s been pretty impersonal. But brace yourself! It’s gonna get personal up in here real quick! Here we go! So, you heard the news? Well, if you haven’t let me tell you. We have decided to adopt. We are so excited to be growing our family in this way and cannot wait to meet the little one that God will bring onto our family. I know that news like this may leave you wondering how we came to this decision, so let me share. But where do I start! I first thought about foster care and adoption when I was in college working at a Salvation Army summer camp. Prior to that time, I didn’t really realize how great a need there was for good homes. I had known about adoption and foster care, but it wasn’t even on my radar. But working at that camp, we had many many campers who where living in group homes or foster homes. And the Lord used that time to plant the seed in my heart. Fast forward to about five years ago, Paul and I decided we were ready to start growing our family. It wasn’t long before we realized that would not be an easy or natural task for us. And for about two and half years of trying for a baby, before Harry was conceived, we started thinking about alternative ways to become parents. While we eventually conceived our sweet little man, we had been thinking more about adoption during that season. But the truth is, we weren’t ready to go down this road yet. As soon as Harry was born, pretty much, we started trying to get pregnant again. We knew it could take some time, so we didn’t want to waste any. And the whole journey in infertility, the heartbreak, the loss, the grief, the medical procedures and bills… those are all topics for another post. But I mention them here because through it all, we continued to think about adoption. I remember calling Paul in tears on the drive home from yet another difficult doctor’s visit a few months ago, and he gently suggested maybe we should revisit the topic of adoption. He was ready to head down this path before I was. I need to clarify, though, it wasn’t so much that I wasn’t ready to head down this path. I just wasn’t ready to stop trying for another baby naturally. And I felt like I couldn’t do both at the same time. The idea of never being pregnant again, never giving birth, never nursing, never seeing a new face that is a combination of mine and my husband’s… that thought makes me sad. And for a long time, I felt like turning to adoption was giving up on that hope. But it’s not. I have not given up hope that I will one day experience those joys again. But we don’t know when or if that will happen. And those specific experiences are such a small piece of motherhood in the grand scheme of things that I know we will love and bond with another baby even without them. And since we have been thinking about opening our home and our hearts to a child through the process of adoption anyway, we don’t want to put it off for something that MAY never happen. So we’re not going to. We are not going to wait another moment longer than we have to. We are adopting! This is real and I am so excited for what God has in store for us now. And I look forward to sharing more as we move forward in this process.